Words: English Traditional from Notes and Queries, Ser. 4, vol. iii, 76. Source: Lucy E. Broadwood and J. A. Fuller Maitland, English Country Songs. (London: The Leadenhall Press, 1893), pp. 102-103. A Carol of Diverus1 and Lazarus. Sung by Carol-Singers at Christmas in Worcestershire, at Hagley and Hartlebury, 1829-1839. 1 As it fell out upon one day. Ev'n down at Diverus' door. Do bestow upon the poor." Or surely starve I shall"
And therefore starve thou shall." For to sit upon an angel's knee." but the original form was as given. the words from Notes and Queries, Ser. 4, vol. iii, 76." It is not claimed that these words belong too the beautiful tune here given ["Lazarus"], but they suit it so well that there is a great probability of their having at one time been associated together. 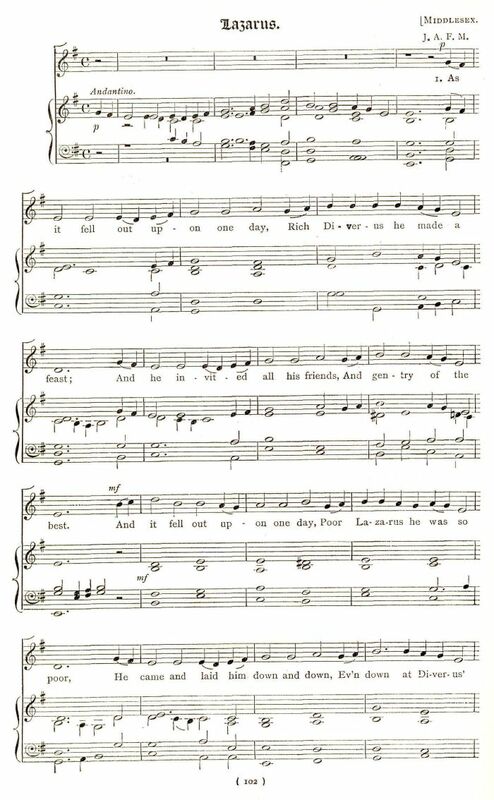 Mr. Hipkins knew no words for the tune, but has known it for many years under the name "Lazarus:" it was also recognized as the tune belonging to a song referring to the same subject, by an old woman in Westminster, in December, 1892. The last verse is quoted by Hone (Every Day Book, vol. i., p. 1598) as being still sung in 1826 in Warwickshire. In the above version the form Diverus is always sung; and the same form is alluded to in Fletcher's Monsieur Thomas (1639). In Beaumont and Fletcher's Nice Valour, act iv., sc. 1, "Dives" is spoken of as one of the ballads hanging at church corners. The tune should be compared with ''The Thresher" (p. 68), and with "Cold blows the wind" (p. 34), as well as with "We are frozen-out gardeners'' in Chappell's Popular Music. The tune strongly resembles "Gilderoy," see notes to" Cold blows the wind " (p. 34). Entry in Notes and Queries, 4th Series Vol. 3, Jan. 23, 1869, Pages 75-76. I forward a copy, from memory, of one of our Worcestershire ballads. This is a carol, or was sung for one, and every village child knew it thirty to forty years ago. I once saw it (about 1833) on a hawker's broadsheet, but have never seen it since; and of late years the clergy have been discouraging carol-singing of this kind. And he married Mary, the Queen of Galilee;"
But this was prohibited, and was always stopped in the houses, with very good reason, judging from a chance couplet I remember to have heard in it. All the old ballads and songs are dying out now, and many may be lost if they are not printed from memory in our own time. The entry in Notes and Queries noted "As sung by Carol-Singers at Christmas in Worcestershire, at Hogley and Hurthbury, 1829-1839." The notice was posted by "F. S. L." Notes and Queries, 4th Series, Volume III, Jan. 23, 1869, pp. 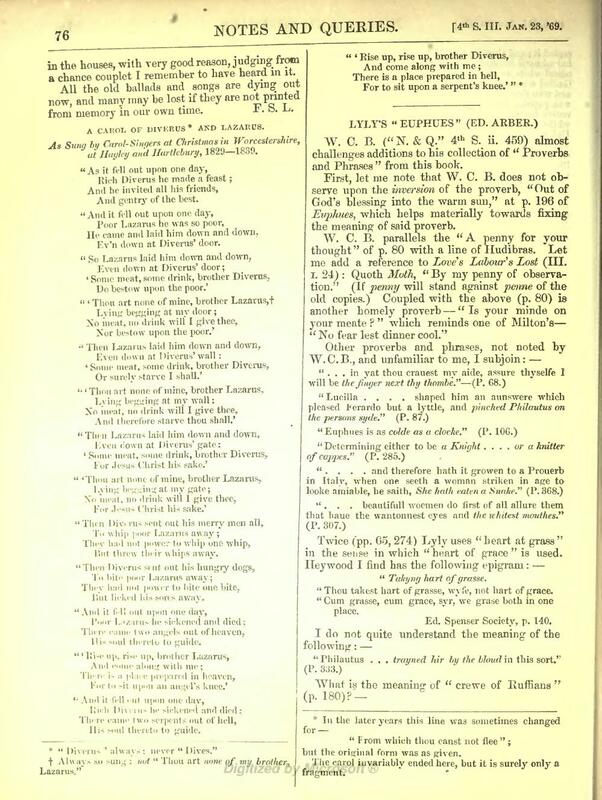 75-76, "A Carol of Diverus and Lazarus." 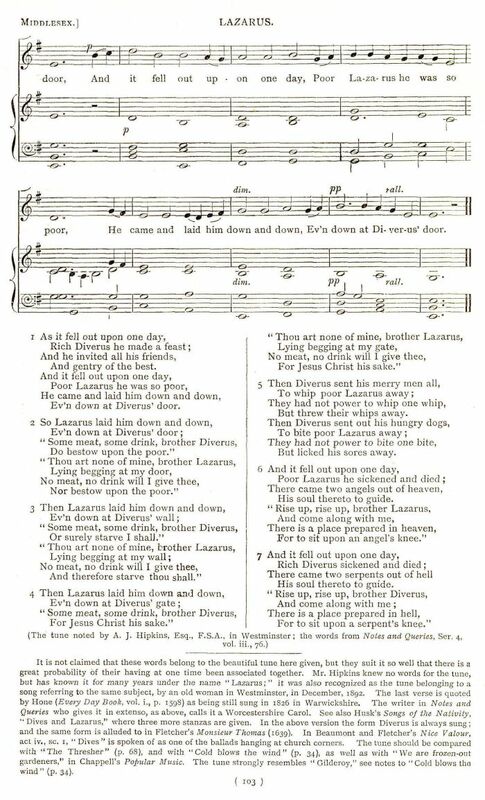 Also in seven stanzas of eight-lines is Dives and Lazarus, a version printed by Richard R. Terry, Two Hundred Folk Carols, however, the words are different.